While waiting for PTC to finally give us Prime 5, I am working on a worksheet for the analysis of the natural frequencies of a generalized beam in Prime 4. I want to write a generalized Mathcad worksheet that can be used to find the nth free-vibration natural frequencies of a beam with nth DOF. The DOF's arise because the beam can be arbitrarily divided into i number of beam elements with i+1 number of nodes and with any defined supports at any defined positions on the beam. I have done this before, however, my worksheet is very limited to a cantilever beam, divided into 3 beam elements. 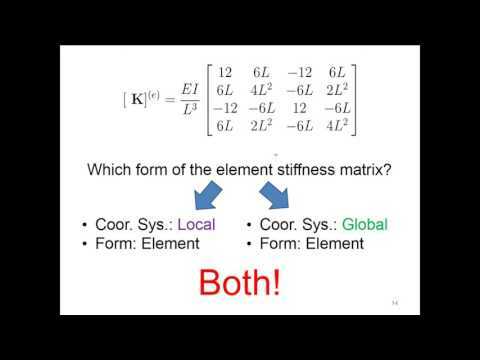 I know what the stiffness matrix of a beam element is, and what its mass matrix as well is. I know how to **manually** assemble the stiffness and mass matrices for up to 3 beam elements...though the assembled matrices get really large and cumbersome to handle, since I basically add in an "analog manner" the individual stiffness matrices of the beam elements. I know how to **manually** reduce the mass and stiffness matrices based on my boundary conditions. I know how to solve the eigenvalues of the characteristic equation (K-w²M)U=0 to get the natural frequencies. So what then is my problem? -Well, my biggest problem is assembling the K and M matrices **automatically** for a beam divided into i elements, having i+1 nodes. So, if someone can help me with a short code that does this, I will be very grateful. -Since I want to make the sheet as general as possible, it has to be considered that the beam elements may not have the same cross-sectional area, length or mass i.e the beam elements may have different mass and stiffness matrices but still have to be assembled together. -Also, I will be grateful if someone can show me how to automatically delete the rows and columns of the assembled K and M matrices based on the boundary conditions at a specific node. In my *analog* worksheet, I basically copy the assembled matrices and manually delete the rows and columns corresponding to the fixed support node. Ready to further expound on the question if someone, kind enough to help needs further clarifications. Enclosed is worth a look. Made a long time ago. It may take you some time to work through it. For simplicity this one uses a constant cross section but you can change this easily. Uses different lengths. For reactions don't delete the row and col just place a relatively very large number on the diagonal at the row col junction and you fix the deflection to a very small number close to zero. does it replace the shaft and have the same internal diameter.